On March 31, 2017, when I drove across the Utica St. bridge in Oswego and looked at the Oswego River it was high and muddy. Later, checking online, I found that water temperature was 40 degrees. 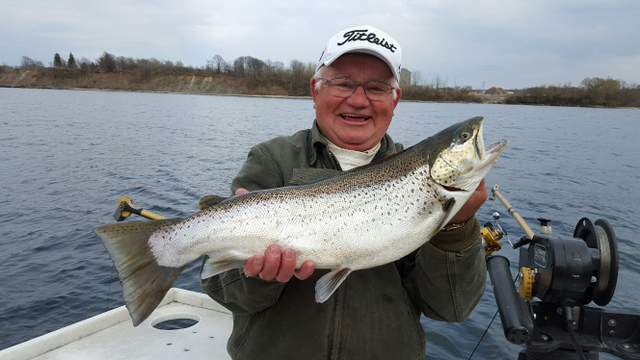 Oswego brown trout trollers could not ask for better early April conditions. Early season browns crowd into shallow water looking for the warmest temperature they can find, a perfect setup for catching them on stickbaits. When the Oswego River is high and muddy that means browns will be in warm, turbid water with low visibility. In these conditions, once you find browns, the key to catching them is lure selection. That normally means noisy, brightly colored stickbaits, with lots of action at slower trolling speed. . This puts Smithwicks 3 ½” and 4 ½” floating Rattling Rogue with its tungsten rattle near the top of the stickbait heap for catching early April browns. Jr. Thunder Sticks, Megabaits, and Rapalas are some of my othe go-to brown trout baits in muddy water. Turbid water Smithwick patterns that catch fish when it’s sunny are the fire tiger and clown. When it’s overcast or mixed light conditions you’ll catch browns on Smithwick patterns like the black/silver/orange belly and blue/silver orange belly. The clown and a plain blue/silver Smithwick will catch fish in lightly colored water. Another fish catcher, if you can find them, in lightly colored water is the Megabait in the Kiro Kin and Blueback. Lots of other stickbaits in many other patterns will catch browns in early season muddy water, but the ones mentioned above will get you started. A 2-yr old Oswego brown boated on April 12 near the Oswego lighthouse. 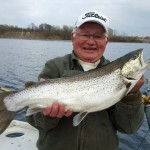 With my charter boat, the Fish Doctor, scheduled to go in the water at Oswego Marina on Monday, April 3 and my first charter trip scheduled on April 8 the question now is, what do the fishing conditions, especially for brown trout, look like??? The answer, considering lake temperature, Oswego River flow and temperature and the 7-day weather forecast…, PERFECT! NOAA says the average lake wide surface temp on March 31 is a smidgeon shy of 40 degrees. Flow in the Oswego River increased from 7,000 cfs on Mar. 24 to 20,000 cfs on Mar. 30 with river temperature rising from 36 degrees on Mar. 24 to 40 degrees on Mar. 31. River water is muddy. The 7-day weather forecast calls for no snow, but rain 6 of 7 days, daytime highs averaging 48 degrees and nightly lows averaging 36 degrees, none below freezing. High and muddy Oswego River flow + river temps above normal + lake temp above normal + enough rain forecast to keep river flow high + 7-day temps well above freezing = PERFECT spring conditions for Oswego brown trout, plus inshore lake trout, and occasional spring cohos, domestic rainbows, Atlantic salmon, and even a chance of early season king salmon. 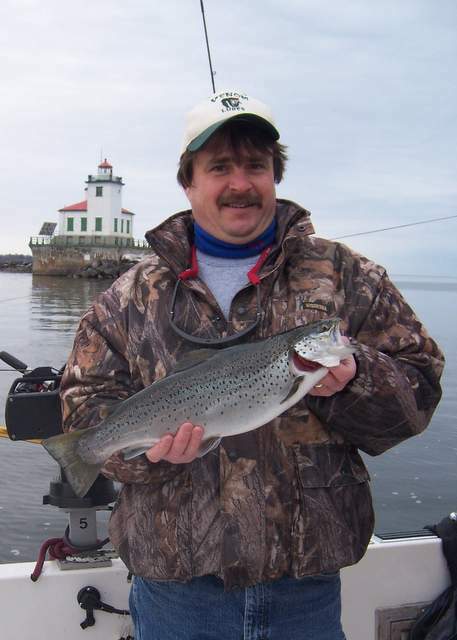 Each season I launch my boat in early April when no other Oswego charter boats are on the water to take advantage of the early spring brown trout fishing around Oswego Harbor. And, each spring, I see the same thing…, almost 100% of brown trout stomach contents are gobies. Early spring browns gorge on gobies and anything else available around Oswego Harbor until spawning alewives move inshore, some years as late as June. Occasionally I see gizzard shad, spottail shiners, and even a few alewives in April browns, but usually they are feeding heavily on gobies. “Round gobies are small fish with large, frog-like heads, raised eyes, soft bodies, and spineless dorsal fins. Males are generally larger than females. They have a distinctive black spot on their front dorsal fin. Mature round gobies are covered by black and brown splotches that lighten when they are alarmed” Gobies reach 7 – 8 inches in length in the Great Lakes and have fused pelvic fins called a suctorial disc with which it attaches to the lake bottom in current. Important to brown trout trollers, gobies, 1) prefer a rocky bottom, 2) rest or literally crawl around on rocky bottom substrate using their oversized pectoral fins, 3) only leave bottom when alarmed, and then only momentarily rise up off the bottom, 4)reach a length of 8 inches or so, and, 5)according to what I’ve been told, move offshore in the winter and then back inshore when shoreline water temperature warms. Think bottom! When actively feeding on gobies, early spring browns are bottom oriented nd muching bait up to 7 – 8 inches long. Surprisingly, many early season brown trout trollers ignore this, and fish small lures well up in the water column with no regard to rocky bottom substrate. Just the tail of a goby protrudes from the mouth of an early spring Oswego brown trout. Lake Ontarie fishermen know that the round goby is now abundant after being introduced through ballast water from ocean going ships. Some things you might not know, as reported by the U.S. Geological Survey are interesting, including the fact that larger gobies feed on zebra mussels. Check out these excerpts from the USGS report. If you have fished with worms for Lake Ontario for smallmouths you’ll agree that gobies are wall to wall in some areas of rocky bottom and real gluttons for worms. I have never observed gobies preying on unprotected smallmouth bass nests, but have observed while scuba diving clusters of yellow perch with their noses down and tails pointed upward gobbling eggs from smallmouth nests. Endangered Lake Erie water snakes! What next? Add to that, brown trout, especially in early spring when browns we catch in the shallows are gorging on gobies. Once the alewives move inshore, however, you rarely find a goby in a brown. I have also seen gobies in lake trout, and even king salmon, and have heard of them in cohos in late August in Mexico Bay. Oswego Trout and Salmon Fishing…, Snow, Baby, Snow! After Stella in Syracuse, NY, centered in the 5,122 sq. mile Oswego watershed. 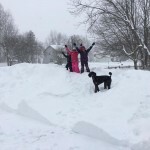 What started as a topsy turvy winter in northern New York with temperature swings into the 60s and very little snow accumulation by early March, is ending in an old fashioned winter. When winter storm Stella plowed thru the northeast, it left an average of 20 inches of fresh powder on the morning of March 16 in the 5,122 sq. mile Oswego River watershed. On top of that, 8 to 12 inches of lake effect is predicted for March 17. 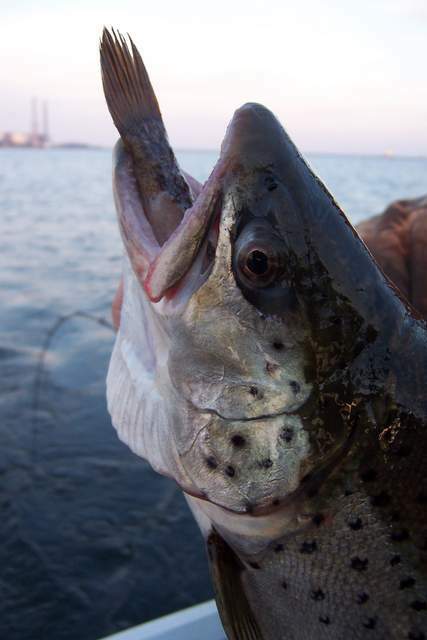 That may be bad news for residents of the area, but for spring brown trout trollers fishing out of Oswego Harbor, the news could not be better. The Iroquois transaltion for the Oswego River they named is, “small water flowing into larger water”. Not quite so small, the Oswego is Lake Ontario’s second largest tributary. 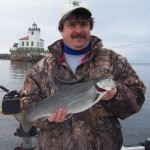 What happens in the way of winter precipitation in it’s watershed has a huge effect on spring fishing out of Oswego. 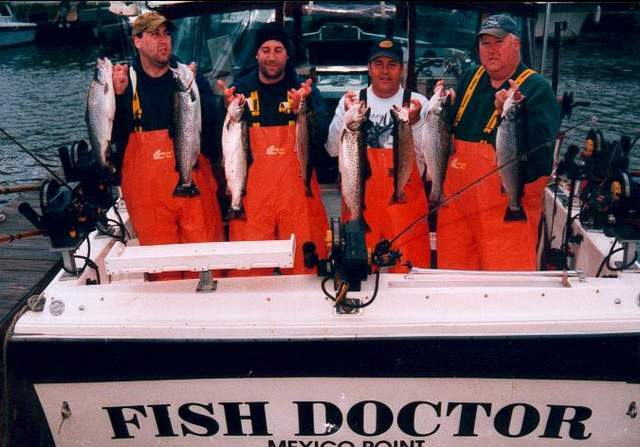 The more flow, the higher and more turbid the warming, nutrient laden river water, the greater the attraction to baitfish and predators, and the better the early spring fishing for browns, kings, lakers, Atlantics, and coho salmon. 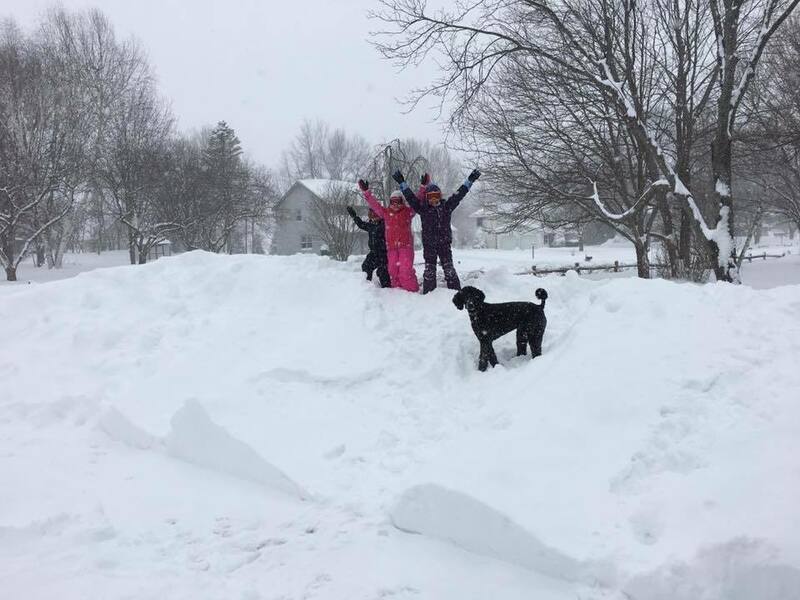 Yes, folks in Central New York are having some tough late March weather and are sure to be tired of shoveling and plowing snow. We’re hearing lots of groaning, but we’re also hearing, “Snow, baby, snow!”, not only by skiers and snowmobilers, but by Oswego trout and salmon anglers. Fishing a current line for salmon. The two anglers in the small but well-equipped fishing boat were frustrated. Six hours of trolling in Lake Ontario had produced only two hits and no fish in the box. Yet, as they returned to Oswego Marina they watched as other fishermen unloaded heavy coolers. They didn’t realize it, but they were learning an important principle. There is a huge difference between blindly dragging a selection of lures from a boat for what is perceived to be randomly scatterred fish, and using that same trolling boat to locate and very systematically present lures to targeted gamefish. 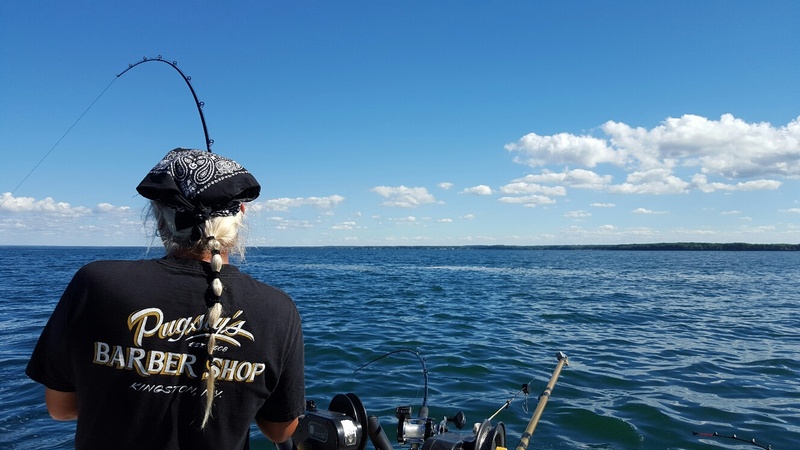 The two anglers were also learning that eastern Lake Ontario holds some of the greatest angling treasures on the North American continent for those who respect this 200 mile long lake and learn to safely reap its rewards. This great water body has a dynamic aquatic ecosystm which changes continually due to the effects of the sun, moon, wind, and season along with changes in the aquatic community itself. For the angler, these changes create a multitude of variables affecting fish distribution and behavior throughout the lake over the course of the entire year. However, the successful angler deals with these variables no differently in Lake Ontario than in a small farm pond. The principles are exactly the same. An experienced bass angler would not think of going out on his favorite largemouth lake or river and begin haphazardly casting a lure without keying in on light conditions, weather, weed beds and other fish-attracting features like submerged structure. 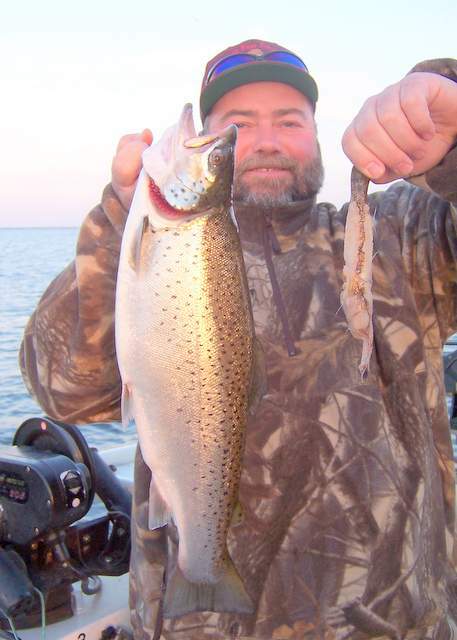 Neither would the seasoned Lake Ontario angler who seeks out offshore thermal bars favored by steelhead or deep water structure holding midsummer browns. The approach by both is similar. 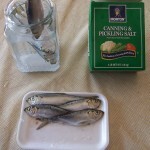 The likelihood of catching one’s quarry increases by spending the maximum time possible properly presenting a bait or lure to it. The big difference between the bass angler on a small pond and the angler trolling Lake Ontario is the visibility of the fish-attracting features and the factors affecting lure presentation. A half submerged tree top along shore is no less important to the bass angler than a current line 15 miles offshore is to the steelhead troller. The action of a salmon spoon trolled out of sight at a depth of 100 feet just off bottom is as critical as the action of a clearly visible surface plug precisely manuvered along the edge of a weedbed for largemouths. Trolling is a favorite angling techinque especially useful for catching widely dispersed fish over a large expanse of water. Yet, even though gamefish may be scattered, they are usually more concentrated in one area than another. Locating and properly fishing these areas is the key to consistent trolling success. 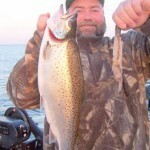 Depite what the book says, shallow water browns can be caught close to the boat! Cone of disturbance or COD for short, is a concept you don’t hear much about from Great Lakes trollers. A few savvy anglers, though, use it to consistently boat more spring browns and other surface oriented salmonid species. It’s the area of disturbance around a boat that pushes fish away vertically, and horizontally a certain distance to what I like to call the “sweet spot”. Reverse this concept, and the same factors can actually attract fish from a distance to the outer edge of the COD around a boat. Things like boat visibility, silhouetted, engine and outdrive noise, prop disturbance and flash, hull vibration, and electrical charge all repel fish a certain distance from a boat. That distance depends on factors like species behavior, activity level, water clarity, light conditions, and lake surface conditions. From experience, I’m convinced that even subtle things like engine lifter noise, affects COD. For some species like the crazy, fearless coho, with a definite attraction to motion and noise, outer limits of the COD may be within arm’s reach. But other more sensitive or wary species like browns, kings and steelhead behave differently, and are seldom caught as close to the boat as cohos. The COD varies from boat to boat, and fortunately, . my 28’ twin engine Baha, with V-8 engines and oversized mufflers, catches browns almost as close to the boat as cohos. The bottom line for anglers is about taking advantage of fish concentrations when presenting baits and lures. As a boat “plows” through the water and pushes fish out to the edge of the COD, fish tend to concentrate a certain distance from the boat. Theoretically, if that distance was 25’ off the beam, and steelhead were equally distributed just under the surface, the concentration of fish in the sweet spot would be 150% or 1 1/2 times greater than the average distribution on the lake surface. Not a bad spot to target, eh? A Penn Fathom 25LW spooled with a leadcore section. 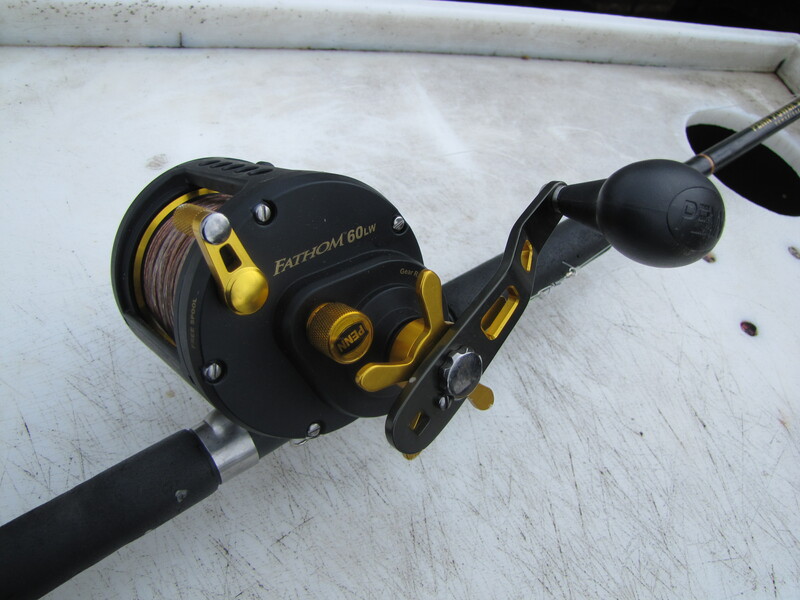 In a recent blog, “Search and Destory” I mentioned that my favorite reel for fishing leadcore sections from planer boards, inlines, and down the chute is Penn’s Fathom 25LW. Since publishing that blog, I’ve had several inquiries about the 25LW from Great Lakes trollers who were looking for a better leadcore reel. Writing from my winter SC headquarters, I don’t have any of the specs handy for the leader/leadcore/backing line capacity of these reels, but can say a few thing about them. 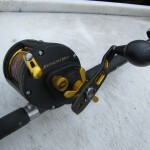 First, the 25LW is a fantastic reel, typical of Penn’s recently manufactured models with influence from ABU Garcia, one of 16(?) tackle companies, along with Penn that Pure Fishing owns. There is nothing I do not like about the 25LW…, silk smooth operation, nice retrieve rate, purrrrfect drag, ample line capacity, nice handle, and last but not least, a loud clicker(for old ears!). I own a bunch of 25LWs spooled with 50’ of 20# leader, 2 to 7 colors of leadcore, plus at least 200 yds. (I’m guessing) of 65# test Berkley braided backing, enough for handling kings. I fish the 25LW on 7’ custom made Fish Doctor Shortsticks and spread out the leadcore sections up to 300’ on megaboards when I’m not near other boats. Works for me! Baited flies and, before that, baited hoochies or squids, in combination with flashers have been a go-to rig for me aboard my charter boat, ever since my first trip to Alaska in 1990. Fortunate to be invited aboard several commercial salmon trolling boats, the first thing I noticed on deck was buckets of 11” plastic flashers, mostly white, green, chartreuse, and red. Hanging on the rear of the cabins were rows and rows of 3 ½” hoochies(squids) in a myriad of colors, some for kings, some for cohos. Closer inspection of the hoochies showed a piece of light brass wire, inside each hoochie, attached to the eye of a 6/0 single hook. The wire on these hooks was for attaching 3”- 4” herring strips inside the hoochie, which rarely go in the water for Alaskan kings without bait. The trollers also showed me how they rigged whole herring, herring filets, and cut plugs, all of which they carry onboard, along with spoons and plugs, during an king salmon opening. 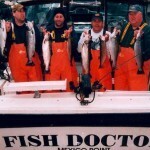 To a man, they were adamant about how fussy king salmon were and how important it was to master a variety of techniques to consistently catch fish in all conditions. I never forgot that lesson, and returned to Lake Ontario with a new perspective on fishing bait for kings and a conviction to do my utmost to become as versatile as possible in fishing for them . I’ve found over the years the baited flies I now call Sushi Flies work well behind all types of flashers all season, including early spring. I use 36”- 48” leaders on 11”- 13” flashers and 19”- 30” leaders on 8” flashers. Flasher/fly color combos are the same as for clean flies. Rather than the single hook used by commercial trollers, I prefer a tournament tie with a 5/0 beak hook and a #2 bronze treble. The same tournament tie used with clean flies can be used with bait, but I prefer to extend the leader length between the beak and treble hooks about 1 ½” so the treble trails at the tail of the bait. 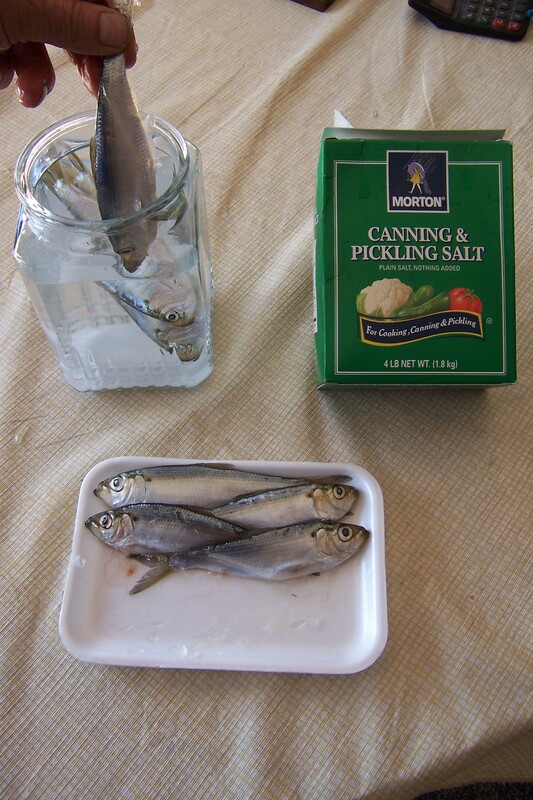 Although, the alewife bait strip can be hooked on the leading beak hook, even a properly prepped alewife bait strip softens quickly in fresh water and seldom will stay on a hook very long. The secret to keeping an alewife bait strip secured inside the fly is to wrap it on the beak hook just behind the hook eye using soft .020” diam. brass wire. Although the brass wire can be attached to the beak hook on a pretied Tournament Tie, I like to attach it before I snell the hook, by simply placing a 3” length of wire midway through the eye of the hook, pulling the brass wire down along the shank of the hook, and tying the snell, leaving about 1 ½ inches of each end of the wire extending to each side of the hook. The head end of a correctly shaped bait strip, tapered to about 3/8”, is then laid skin down against the hook shank, and the brass wire is wrapped from opposite directions around the bait with enough tension to slightly bury the wire into the meat on the bait strip. It is not necessary to twist the ends of the wire together to hold the strip. The wired bait will remain in the fly as long as you fish it. I prefer lightly dressed flies for use with bait strips. 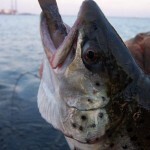 Years of experience and millions of Great Lakes king salmon have proven clean flies catch fish. When it comes to inactive kings, though, especially staged fish or big, lazy fish, I’ve found that sushi flies are just what the doctor ordered.